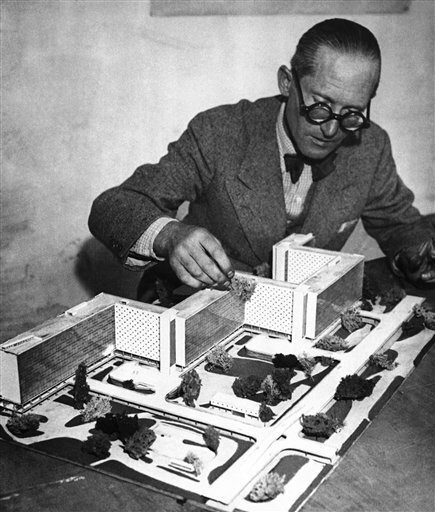 Born Charles-Edouard Jeanneret-Gris on October 6, 1887, Le Corbusier was the second son of Edouard Jeanneret, an artist who painted dials in the town’s renowned watch industry, and Madame Jeannerct-Perrct, a musician and piano teacher. His family’s Calvinism, love of the arts and enthusiasm for the Jura Mountains, where his family fled during the Albigensian Wars of the 12th century, were all formative influences on the young Le Corbusier. At age 13, Le Corbusier left primary school to attend Arts Décoratifs at La Chaux-de-Fonds, where he would learn the art of enameling and engraving watch faces, following in the footsteps of his father. These trips played a pivotal role in Le Corbusier’s education. He made three major architectural discoveries. In various settings, he witnessed and absorbed the importance of (1) the contrast between large collective spaces and individual compartmentalized spaces, an observation that formed the basis for his vision of residential buildings and later became vastly influential; (2) classical proportion via Renaissance architecture; and (3) geometric forms and the use of landscape as an architectural tool. In 1912, Le Corbusier returned to La Chaux-de-Fonds to teach alongside L’Eplattenier and to open his own architectural practice. He designed a series of villas and began to theorize on the use of reinforced concrete as a structural frame, a thoroughly modern technique. Le Corbusier began to envisage buildings designed from these concepts as affordable prefabricated housing that would help rebuild cities after World War I came to an end. The floor plans of the proposed housing consisted of open space, leaving out obstructive support poles, freeing exterior and interior walls from the usual structural constraints. This design system became the backbone for most of Le Corbusier’s architecture for the next 10 years. In 1917, Le Corbusier moved to Paris, where he worked as an architect on concrete structures under government contracts. He spent most of his efforts, however, on the more influential, and at the time more lucrative, discipline of painting. Then, in 1918, Le Corbusier met Cubist painter Amédée Ozenfant, who encouraged Le Corbusier to paint. Kindred spirits, the two began a period of collaboration in which they rejected cubism, an art form finding its peak at the time, as irrational and romantic. for instance. Maison Citrohan displayed the characteristics by which the architect would later define modern architecture: support pillars that raise the house above the ground, a roof terrace, an open floor plan, an ornamentation-free facade and horizontal windows in strips for maximum natural light. The interior featured the typical spatial contrast between open living space and cell-like bedrooms. he built a workers’ city of 40 houses in the style of the Citrohan house at Pessac, near Bordeaux. Unfortunately, the chosen design and colors provoked hostility on the part of authorities, who refused to route the public water supply to the complex, and for six years the buildings sat uninhabited. The Radiant City brought with it some controversy, as all Le Corbusier projects seemed to. In describing Stockholm, for instance, a classically rendered city, Le Corbusier saw only “frightening chaos and saddening monotony.” He dreamed of “cleaning and purging” the city with “a calm and powerful architecture”; that is, steel, plate glass and reinforced concrete, what many observers might see as a modern blight applied to the beautiful city.